If you want to know ‘How to Increase Google Ranking for Free?‘, then you are at right place. Below, we have discussed the ways of getting your website to the top of Google. 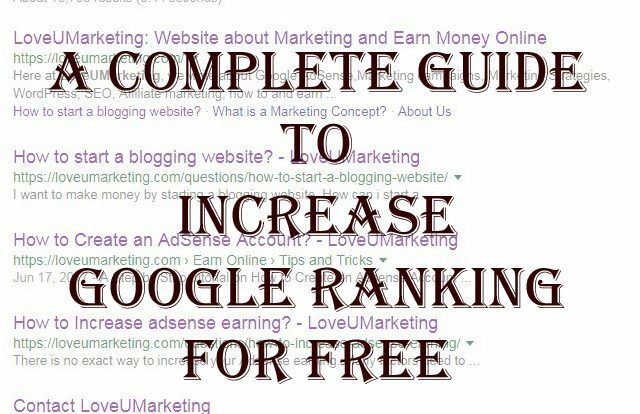 It includes a Complete Guide to Increasing Google Ranking for Free. According to one study, the top organic position received average traffic of 33% followed by 18% and 11% for the second and third position respectively.So, if your website is appearing in the fourth position then the chances are very low that the organic user will visit your website. The best place to hide a dead body is second page of Google. 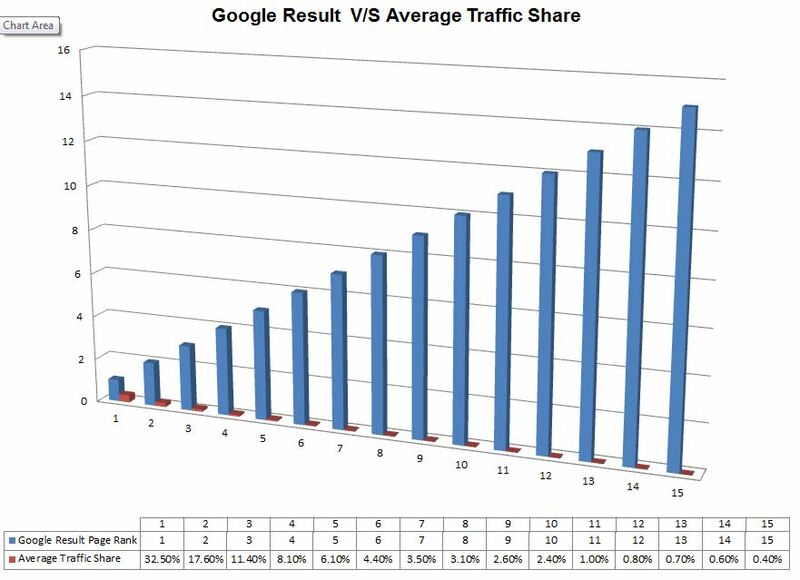 In the above Graph, you will find that the Traffic Share is inversely related to the Google Ranking. With the Increase in ranking, there is a decrease in the traffic source. So, if you want to drive traffic to your website then it should appear on the first page of the Google. Remember, there is no magic button to get your website on the first page. You need to earn it. You need to work very hard on your site and optimize it fully. Don’t worry, we will tell you how to do this? To rank your website on the first page, you first need to learn the working of Google Search Engine. Refer the below Infographic to know How Google Search Algorithms Work? Here, the term ‘Search Query‘ is very important. If you want your site on the first page then you need to find the Keywords used in this Search Query. If someone asks you, Which option will you select, then what will you reply? Of course, the second one. You will use the keyword ‘Earn Money Online‘. Because the CPC Rate and Monthly Search Volume is much higher than the other one. Exactly, the same thing you need to do for your website. You need to use such kind of keywords in your content. How to Find Keywords On Your Website or Blog? Wait, it is not yet over. This is only the first step. Besides this, you also need to ensure so many other things like Loading Speed of the Website. Mobile Friendliness etc. Read below to know more about these factors. 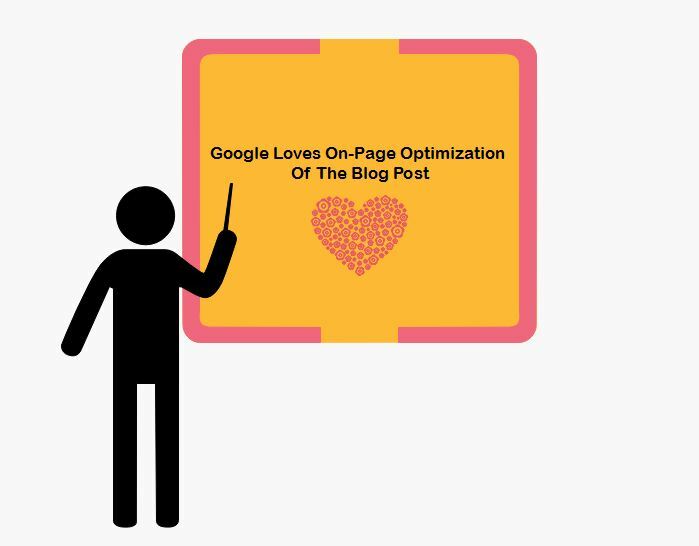 This is the first and most critical factor in improving the Google ranking of your website. On-Page SEO plays an important role in determining the Quality of your content and thereby boost your ranking. Meta Keywords should also appear in the first paragraph of the article. Use relevant and high CPC Keywords. Use these On-Page SEO Techniques to optimize the content on your site and thereby rank to the first page of the Google Search. Check out the below article to known how to write a great blog post? 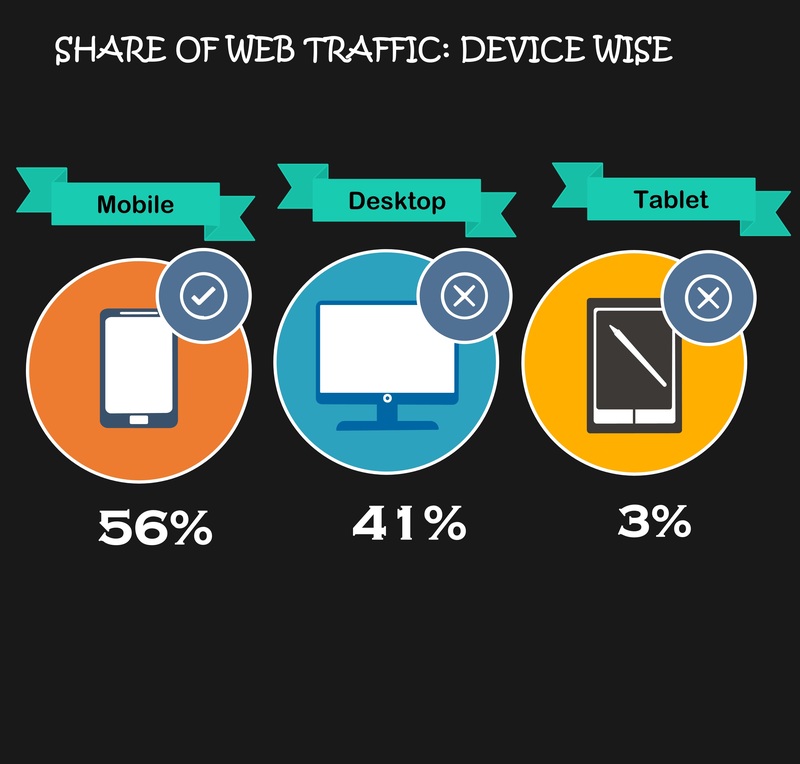 According to one study, Mobile contribute more than 50% of the Web Traffic. Below, you will find the device wise contribution to Web Traffic. Google Search is also considering the use of mobile-friendliness as a ranking signal. It gives more preference to a mobile-friendly website than other. If your website is not mobile friendly then there are fewer chances that your website will rank on the first page and drive enough traffic to it. Here, We also like to discuss the AMP (Accelerated Mobile Page). It is an open source initiative to improve the performance of web content and advertisements on a mobile. In a simple language, it is a project to improve the performance of the website over a mobile phone. If your website is using AMP then, it will load faster than other websites. In the above Image, the term ‘AMP’ indicates that the web pages are optimized by the AMP Pages. According to one study, it takes 22 seconds to fully load the website on Mobile. But more than 50% of the user left the website if it takes more than 3 seconds. 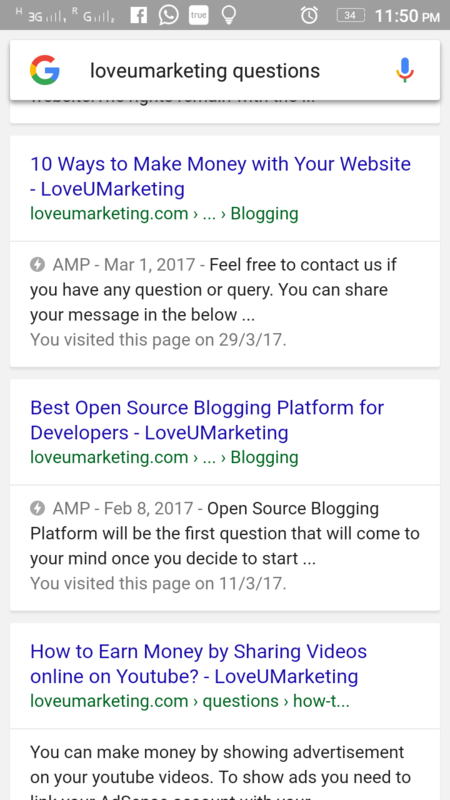 How to Setup AMP Page in WordPress? 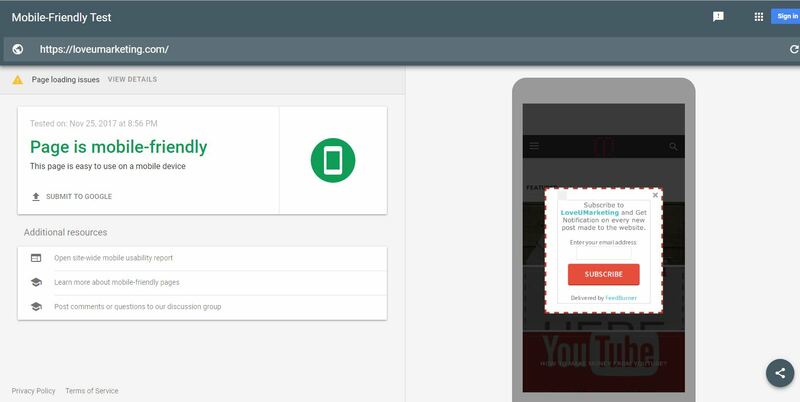 Google’s Mobile-Friendly Test allows you to check whether your website is mobile friendly or not? It is another critical factor in improving the Google ranking of your website. Google Search prefers those websites which load faster.So, it is very important to improve the loading speed of your website. According to kissmetrics, 45% of people abandon a website that takes more than 3 seconds to load. 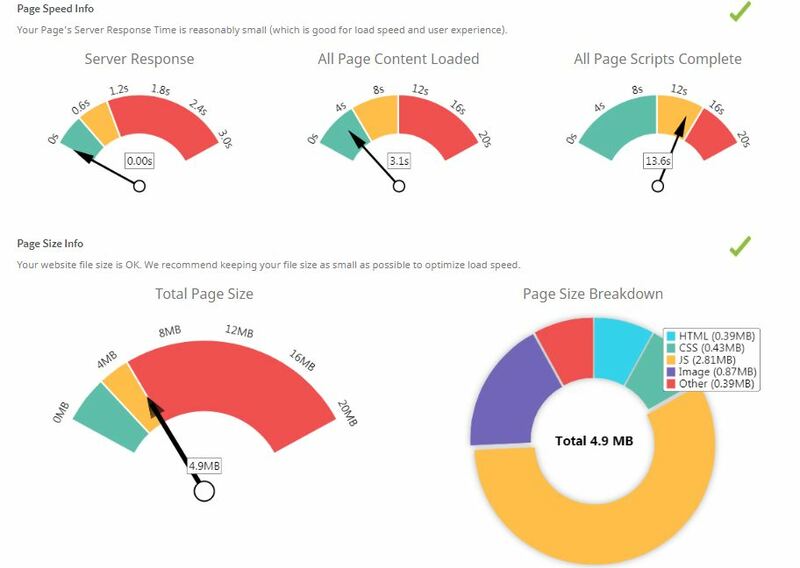 You can check the loading speed of your website at any of the below three websites at free of cost. Of course, there are many other tools to check the loading speed of your website but above three are the well-known tools in this area. Here, the term Good Backlink is very important. Getting the only backlink will not help your site. If you want to improve your Google ranking then the backlink should be from a good source. It is also important to note that these backlinks should be natural. Google is capable to identify the unnatural backlinks. We know, right now many questions are arising in your mind. You will find the answers those questions below. Backlinks from Por*, Gam*ling, S*x etc sites are not good backlinks. Backlinks from a totally unrelated niche site and automatically generated backlinks are the examples of UnNatural Backlinks. So, it is very clear to improve the search ranking of your website, you need to earn backlinks. Shortcut Method will not work for this. If you have un-natural backlinks to your website then you can disallow the same in your Google Webmaster. How to get Quality Backlinks on .EDU and .Gov Websites? How to build backlinks for the new website? You can check out this backlink tools to check the number of backlinks pointing to your sites. This tool is totally free to use. First, to create a successful website, you can not neglect the importance of User experience. Create a website for your user, not for the SEO. If your user doesn’t like your website then they will not come back to your site. So, User Friendliness is more important to create a successful website. Second, at the end of the article, a question may be arising in your mind, How to get all the above information for your Website? If the same question is coming to your mind then don’t worry, we have an answer to your question. You will be happy to know that there are many free Audit tools available online. You can analyze your website using the free tool and get the complete information about your website. This Audit Report includes Loading Speed, Mobile Friendliness, Security, Backlinks and many more things. We are using SEO Optimizer to check our website LoveUMarketing.